As part of HEI’s service to humanity initiative, HEI doctors often travel to underdeveloped countries where no qualified local surgeon is available to perform specialized ear surgery. While there, they also provide on-site training to ear doctors in these countries. In the future, technology like telemedicine could allow HEI doctors to assess patients both in the United States and internationally, allowing to make recommendations to on-site medical staff regarding their patients’ treatments. HEI doctors often travel to underdeveloped countries to perform specialized ear surgery where no qualified local surgeon is available. While there, they also provide on-site training to ear doctors in these countries. 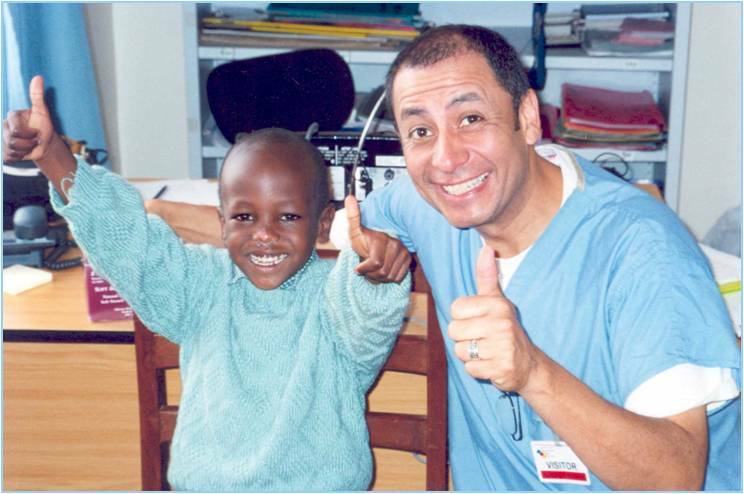 way around the world, covered most of his own costs, and risked his own health and well-being just to provide children in Africa with hearing evaluations. A local church and the internationally acclaimed ministry Feed the Children sponsored Albert’s trip to Nairobi, Kenya, whose purpose for the trip was to provide a local abandoned baby center with equipment, supplies, and a “whole lot of love.” The Hough Ear Institute provided medical equipment, and Albert conducted hearing screening on approximately one hundred children. “We quickly learned,” stated Ramirez, “more than twenty-five percent of the children had serious hearing issues. This is, I think, brought on by poor hygiene, especially as it relates to unhealthy water conditions.” One direct benefit of the trip is a treatment center for persons with profound hearing loss.